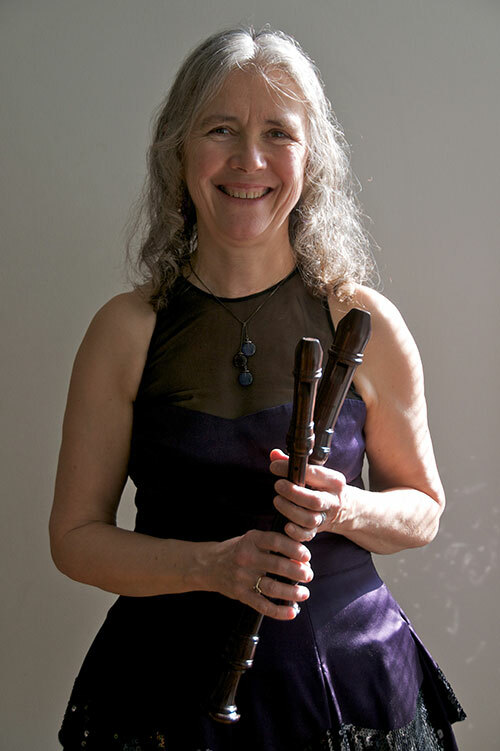 Nancy Daly ARCM GRSM was the first graduate on recorder at the Royal College of Music in London, at a time when pioneers such as Frans Brüggen and David Munrow were bringing ‘authentic’ Early Music to an eager public. After graduating, Nancy spent a year teaching in the Edinburgh area before settling in the West Country to take up a position as Principal Recorder Tutor at the newly founded John Loosemore Centre for Early Music in Buckfastleigh. Whilst raising a family Nancy became firmly established in the musical life of South Devon, teaching at many of the schools, running her own classes and workshops for adults and children of all abilities, as well as performing occasionally. She also held the post of Recorder and Early Music Specialist at Wells Cathedral School – one of the top four specialist music schools in England – as well as teaching recorder students at Dartington College of Arts and at Exeter and Plymouth Universities. Moving to London in 1999 led to a change of direction and Nancy started teaching for Haringey Music and in some Camden schools. This was mainly in Primary Schools working with much younger children and taking on many beginners. This coincided with Nancy’s discovery of the Suzuki Method for the recorder – at that time unavailable in the UK – which inspired her to travel to the USA for Suzuki training, and which in turn resulted in a change of teaching methods with both private students and school pupils. Over the years, Nancy had encountered far too many poorly taught children who had learnt from teachers who were themselves only one step ahead of their pupils. As a result, her teaching career has centered around the desire to see the recorder firmly re-established as a ‘serious’ instrument, and to destroy the popular misconception of the recorder as a children’s classroom instrument or as a starter for other woodwind instruments. Nancy has always enjoyed working with adults, and has long been interested in the idea of training teachers how to teach the recorder in a professional manner. She was looking for a training with the prospect of not only augmenting her existing skills, but also with the potential to inspire and guide a new generation of teachers to appreciate the unique qualities of the recorder, and therefore to teach the instrument in a fulfilling way. The Suzuki Method has proven ideal for this in every way, but in particular in its emphasis on listening and on producing a beautiful sound, and in its insistence that teachers aquire a high standard of playing before commencing training – something hitherto rare amongst children’s recorder teachers. Nancy has recently relocated to the Dorking area in Surrey where she teaches both privately and in local schools, whilst continuing to work in northwest London.